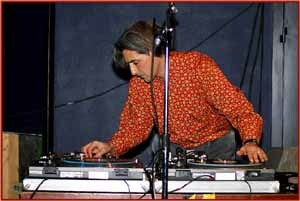 Lou Mallozzi is a Chicago-based audio artist who works in live performance, radio art, sound installation, CD recording, and soundtrack design. He has presented works at numerous festivals, concerts, galleries, and broadcasts since 1986, including the Bludenz Festival for Contemporary Music (Austria), the TUBE Audio Art Series (Munich), The Museum of Contemporary Art (Chicago), The Fort Wayne Museum of Art (Indiana), Podewil (Berlin), The PAC/edge Performance Festival (Chicago), Aetherfest Radio Art Festival (Albuquerque), The Resonance FM Radio Festival (London), Bayerischer Rundfunk (Munich), The Chicago Cultural Center, The Donald Young Gallery, and many others. He has collaborated with numerous artists in these endeavors, including Sandra Binion, Michael Vorfeld, Mats Gustafsson, Jaap Blonk, Michael Zerang, Carlos Zingaro, Birgit Uhler, Fred Lonberg-Holm, Hal Rammel, Terri Kapsalis, ensemble Intégrales, Guillermo Gregorio, and many others. Mallozzi has released several CDs, including Radiophagy (radio art works, Penumbra Music), Whole or By the Slice (with Hal Rammel, Penumbra Music), and Grammar (with Carlos Zingaro and Fred Lonberg-Holm, Rossbin Records). He has appeared on several compilations and as a participant in several released recordings, including Faktura by Guillermo Gregorio (Hat Art), Material by Cornelius Cardew (Hat Art), and I'm Sick About My Hat by John Corbett (Atavistic). He has also designed and edited the soundtracks for a number of independent films, including Fever by Paula Froehle, Israel in Exile by Juan Ramirez, The Quiet by Thomas Silva, The King of the Tango by Karen Freidberg, and the Academy Award nominated short animation Stubble Trouble by Joe Meredith. Mallozzi has received a number of grants and awards for his work, including a residency at the Rockefeller Foundation's Bellagio Study Center in Italy, four Illinois Arts Council fellowships, and grants from the Driehaus Foundation and the Governor's International Arts Exchange Program. He is the Executive Director of Experimental Sound Studio and teaches in the Sound Department of the School of the Art Institute of Chicago.